New House Resolution Calls for Declassifying Secret Portion of 9/11 Report. Rep. Walter Jones (R-NC) introduced a resolution this week in the House of Representatives urging President Barack Obama to declassify 28 pages of a joint House and Senate Intelligence Committee report that includes information concerning foreign governments' involvement in terrorist attacks in the US. The George W. Bush administration redacted the pages from the December 2002 report of the Joint Inquiry into Intelligence Community Activities Before and After the Terrorist Attacks of September 2001. A new poll indicates that some 43 percent of Americans believe that Washington knew about the 9/11 attacks but did nothing to stop them. According to the Press TV-Zogby International poll, 42.5 percent of the respondents believed that the Bush Administration knew about the September 11 attacks on the World Trade Center but did nothing to prevent the attacks. Only 37.5 percent of the respondents strongly disagreed with the idea and 4.5 percent neither agreed nor disagreed with it. BIN LADEN INNOCENT FOR THE 911 ATTACKS ? 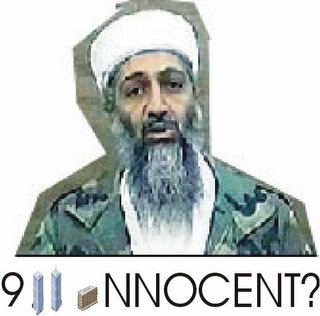 "Is Bin Laden innocent for the 911 attacks ?" It is only a question. I have tried this out here in France and it has proved to be the "shock and awe" treatment needed to undo the mind-manipulation of the mass media over the last six years.